This beautiful area is in the far south of Colombia and has gained its name because it is a part of the Amazon basin where the borders of Colombia meet those of Brazil and Peru. The area is part of the most naturally beautiful region of the Amazon, and there are many people who travel there to enjoy these stunning surroundings, with some magnificent animal species and wonderful activities to see and enjoy. The main destination in the area for those traveling from within Colombia is the city of Leticia, which is a great base from which to explore the area and has become one of the biggest tourism destinations in Colombia because of its wonderful location. Like many of the great towns and cities of the Amazon, the location near the river has proved to be one of the most important features of the Tres Fronteras region, and the river traffic here combined with the borders have helped to increase the popularity and economic prosperity of the area. There have been settlements in the area since the nineteenth century, with the area changing hands between Colombia and Peru before the current situation saw the area decreed to be an area of Colombia in 1934. During the 1960s and 1970s, the remote area became a hotbed of drug activity, but this has been cracked down upon, helping the modern tourist industry to grow in this interesting area. Tres Fronteras is a great base to explore natural parts of the Amazon, and a trip to the beautiful Amacayacu National Park is certainly worth doing, as it is a stunning area of the jungle which is flooded annually. Lucky visitors can spot many species of monkeys along with river dolphins and the largest species of freshwater turtle in the world here. You can take a night safari into the jungle which reveals some of the interesting nocturnal species found in the area, while there is also the interesting Micos Monkey Island, which has some of the indigenous species that have become accustomed to human contact, where you can also feed the monkeys. In the city of Leticia, Parque Santander is a great place to visit around dusk, as there are a lot of trees in the park, and every night over two thousand parrots flock to the area to spend the night in the trees. This makes for a spectacular sight and you can enjoy the beautiful colorful markings of the birds as they fly by. There is a church with a tower next to the park, and many visitors have reported being able to watch the parrots flying into the park from the tower of the church for a small donation. The largest base that people will use when staying in the Colombian part of Tres Fronteras is Leticia, while there are also settlements over the borders in Peru and Brazil. Accommodation is generally pretty basic with some reasonable hotels and hostels available, while those looking for a more authentic taste of the area can head out to one of the jungle lodges around the city. Freshwater fish plays an important role in the cuisine of the area, while you will also find plenty of fresh fruit and vegetables on the menu, some of which will be more familiar than others. You can also find pizza places, steakhouses and South American cuisine on offer in Leticia, where the majority of the restaurants are located. There are only two ways of getting to the area, and that is either by airplane or boat. The flights into the airport in Leticia connect to Bogota, with a journey of around two hours, while across the border in Tabatinga, Brazil, you can also take flights to Manaus. 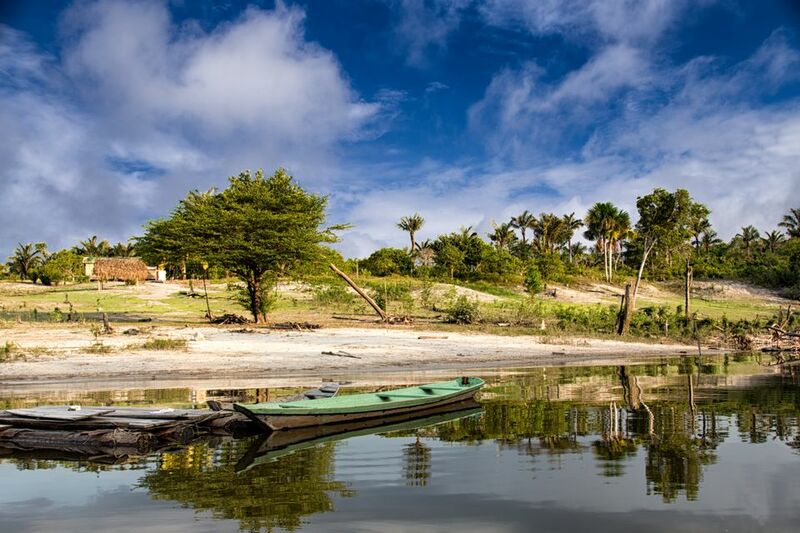 The alternative is to get into Tres Fronteras by boat, with routes connecting the area with the cities of Iquitos in Peru, and Manaus in Brazil.